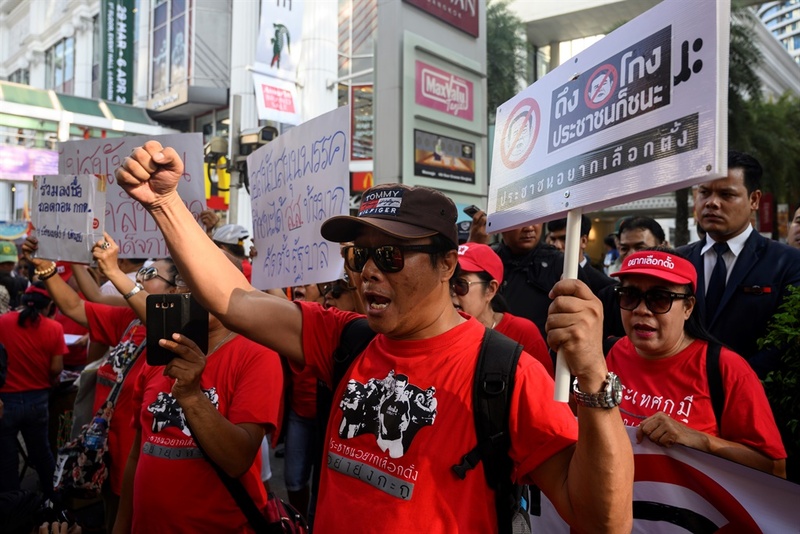 As wait for the official result in Thailand's elections continues, scores of opposition supporters in the capital have protested against alleged cheating by the election commission in the country's first polls since a coup five years ago. A week after the March 24 vote, the outcome remains uncertain. It might not be known until after the commission publishes official results due on May 9. The body released partial results the night of the polls, and took four more days to publish fuller counts, showing a party supporting the military government winning the popular vote but the opposition Pheu Thai party ahead in partial results of House of Representatives seats. The demonstrators urged bystanders to add to the 830 000 signatures on an online petition to impeach the commission. On Saturday, the king issued an order revoking royal decorations that had been awarded to Thaksin Shinawatra, a former prime minister who was ousted in an earlier 2006 army coup and is linked to the Pheu Thai party. Thaksin-linked parties have won every election since 2001. The 2014 coup ousted a Pheu Thai-led government that had Thaksin's sister, Yingluck Shinawatra, as prime minister.